Last Updated 4:37 p.m. ET; Click here for latest updates. 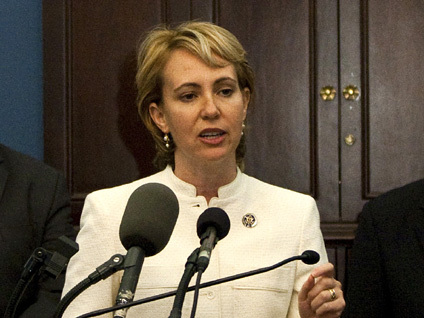 Rep. Gabrielle Giffords, D-Ariz., was shot in the head and an aide was killed Saturday when an assailant opened fire in an area where the lawmaker was meeting with constituents, officials said. Also killed was U.S. District Judge John Roll, the U.S. Marshal for Arizona David Gonzales confirmed. .
A young child approximately 9 years old was also killed, according to a hospital spokesperson. Giffords is in critical condition from a gunshot to the head, but the spokesperson said he was "about as optimistic as I can get in this situation" that she will recover. Initial reports by CBS Affiliate KOLD that the Congresswoman was among the fatalities were corrected by her press people, who told KOLD that she is alive but in emergency surgery. "She is currently in surgery. She is still alive," said Darcy Slaten, Public Affairs, University Medical Center in Tucson. Hospital spokespeople said Giffords is in critical condition. Eight other patients also at hospital are in critical or serious condition. The assailant sprayed bullets into an area where the Democratic lawmaker was hosting a "Congress on Your Corner" event at a Safeway supermarket. Police said the suspect, Jared Loughner, 22, has had one minor run-in with the law. Little information is known immediately about Laughner - such as his background or a possible motive in the attack. Police said a pistol with an extended magazine was used. A law enforcement source told CBS News that a man apparently stood up in the crowd during the town hall meeting, shouted something and then opened fire. Someone - possibly police or security - then shot at the gunman. The gunman has been apprehended but it is unknown if he was wounded. A Federal law enforcement source tells CBS News that the suspect was born in 1988. No name yet being released. He is talking to authorities, but there is no evidence at this point that there is any other shooter involved. The FBI and local law enforcement are investigating the attack. In a statement President Obama called the shooting "an unspeakable tragedy," and said such "a senseless and terrible act of violence has no place in a free society." Sen. John McCain, R-Ariz., released a statement saying he was "horrified by the violent attack on Rep. Gabrielle Giffords and many other innocent people by a wicked person who has no sense of justice or compassion. I pray for Gabby and the other victims, and for the repose of the souls of the dead and comfort for their families. Giffords, 40, who just started her third term in Congress, was reelected in November after defeating Republican and Tea Party favorite Jesse Kelly by a margin 49 percent to 47 percent. A moderate Democrat, Giffords has drawn the ire of the right, especially for her support of the health care bill. Shortly following her vote in favor of the health care reform law last March, her office in Tucson was vandalized, leaving the front door smashed. Giffords was also in news this year for being one of three Democrats who received a donation from liberal MSNBC host Keith Olbermann, which led to a short suspension for the host from the cable channel. She also participated in Thursday's reading of the Constitution on the House floor. She read the First Amendment, saying: "Congress shall make no law respecting an establishment of religion, or prohibiting the free exercise thereof, or abridging the freedom of speech, or of the press, or of the of the people peacably to assemble, and to petition the government for the redress of grievances." According to her office, the "Congress on Your Corner" events allows residents of her district "to meet their congresswoman one-on-one and discuss with her any issue, concern or problem involving the federal government." Her office says she has hosted "numerous" events since taking office in 2007. Giffords' husband is Mark Kelly, an astronaut who is scheduled to command the Shuttle Endeavor when it launches in April. Her brother-in-law, Scott Kelly, is in charge of and currently aboard the International Space Station.